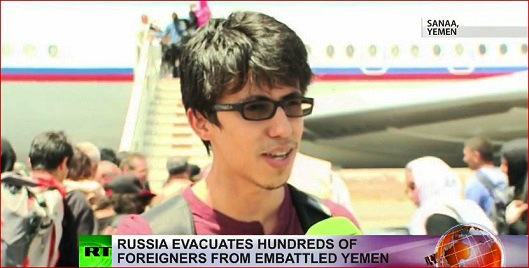 Russia Evacuates American Citizen In Yemen Abandoned By The U.S. The lack of clarity over the evacuation of US citizens from Yemen continues, as more Americans are lifted from the warzone by Russian planes. A relieved family of 10 spoke to RT amid Washington’s continuing inaction. While it continues to say it’s too risky to evacuate its own, one American told RT of his disbelief at his government’s lack of effort to get his family to safety. A Russian rescue plane on Friday reunited them at New York’s JFK Airport. “I really got lucky with Russia. It was a three-hour notice, I was contacted by them and they said they will provide a plane,” Khaled Alamari told RT in the arrivals hall, describing the trauma his children had faced amid the constant fighting and explosions. One of his daughters lost nearly half her body weight, the Yemeni-American adds. The US State Department says it has been issuing guidelines for US citizens stuck in Yemen on how to leave the war-torn country, but the Americans evacuated by Russian planes say they haven’t heard a word. Meanwhile, the online help system the US government has set up is being lauded by spokeswoman Marie Harf, who advises the stranded people to sign up and “stay in touch” for news through email and text messages. Alamari’s relatives are among some 1,700 already rescued from 20 countries on nine flights. His family was supposed to fly home just before the bombings began. But all flights were canceled, leading Alamari to contact the State Department. Another stranded civilian who spoke to RT by phone was on his way to the airport when an airstrike demolished the road in front of him, in effect blocking his only path to the capital, Sanaa. Several others died in the explosion. The Russian Foreign Ministry says it could continue the evacuation, if needed. And there does appear to be a need. With hundreds already taken out of the warzone, many remain stranded. On Wednesday these 20 Americans on Russia-bound flights from Yemen told RT that they had been left to their own devices and had had to resort to help from private organizations and foreign governments in order to flee the country. Meanwhile, people marooned in Yemen have been sending text messages to RT, revealing the extent of their desperation. No one mentioned anything about the US government online help system Harf was talking about. Bombs continue to pelt Yemen and grey smoke continues to adorn the daytime skies, as Operation Restoring Hope gets underway. It is intended to incorporate a dialogue between the supporters of the exiled president and the Shiite Houthi rebels – the country’s main opposition force – into the wider anti-terrorist framework. On April 21, the Saudi-led coalition said it wrapped up Decisive Storm, which, by UN estimates, claimed the lives of over 550 civilians.